30 years ago, a totally unique games console was launched using vector - not raster - graphics. It had such an impact that games are still being made for the platform today. We bought our first Vectrex in 1982 and we still love it! Built by Vectrex fanatics for a new generation of gamers. Vectrex Regeneration. Out now for iPhone and iPad. "Exquisitely Detailed", "the experience truly is authentic", "an impressive Vectrex experience", Touch Arcade; 4 / 5 stars. Before we had the Sega and Nintendo we had the Vectrex and Atari. The Atari may have been more popular, but the Vectrex was vastly superior in many ways. Vectrex was a 'portable' games console with a built in monitor and awesome vector graphics. 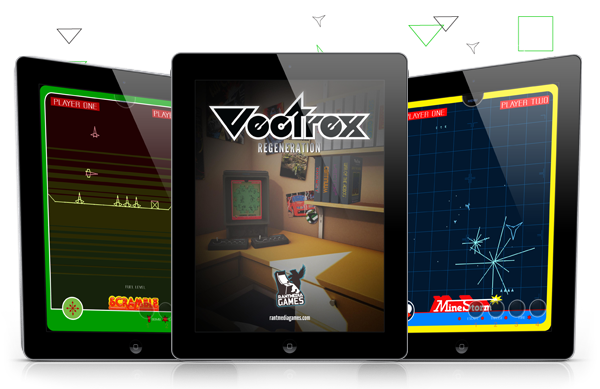 Vectrex Regeneration is available in the iTunes App Store for both iPad and iPhone. You can even play on your Apple TV whilst using Airplay from your iPad or iPhone. Let us know if you would like to see Vectrex Regeneration on any other platforms. Now! contact us on our Twitter feed or signup on our mailing list. Get in touch! Contact us via Twitter or Email us. We want your feedback!